Like all of us; “MADE IN GOD”S IMAGE” is a huge understanding to celebrating life. God’s very glory is reflected in each and every one of us in a very unique way, we were made for that, to reflect God so the whole world can see that facet of God’s glory we uniquely bear and if we don’t reflect that no one else can. I believe that’s what the Angels long to see in us, that unique aspect of God, His glory reflected. To understand how my dad reflected God, let me share the stories that I believe illustrate God’s Glory, though broken, as we are, still our true colors do come shining through in Christ. Just as God named his favorites deepening their identity, my dad’s identity was deepened in his name. My grandfather, Hermon Dilmore was fascinated with the story of Scotland’s – Outlaw King, Robert the Bruce. He loved it so much he named his third son Robert Bruce Dilmore and even as a young boy he shared the stories with my dad, stories of a warrior King bent on freedom, outlawed and hunted for his very life, (sound familiar). 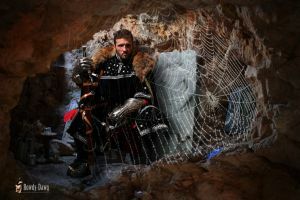 My grandfather’s favorite story was when Robert the Bruce was given the vision of a spider trapping it’s prey and was inspired by God to stop running and fighting as an outlaw but stand and lure the English army into his web. The result was freedom for the Scots, but a freedom that only came on the other side of war. The life and death struggle of war came on my father early and as God allows, training my dad to be a warrior with live fire before he was ten. He got a horrible case of chicken pox and without anyone knowing it, one chicken pox festered underneath a tonsil for months the resulting infection weakening his heart for years to come, but at the time it truly threatened his life, once discovered he was too weak to take any anesthetic so he had to have his tonsils removed with nothing to put him to sleep or kill the pain, saving his life, yes, but the wound and his hatred of hospitals, doctors and pain stayed with him till the end. The next real battle in my dad’s warrior training was at home, being the sickly child he got more than his fair share of his parents attention, so like Joseph’s brothers in the Book of Genesis, they really wanted to throw him in a pit, but they settled for bullying him especially his oldest brother, Hermon, Jr.. Little did Hermon know that what Satan meant for evil God used for good as this injustice brought out the warrior in my dad; he hated a bully and I mean if you wanted to see my dad’s passion let him even guess someone was being bullied and he was on them like white on rice. Yes, Jesus is a Juggernaut and so is my dad, little did I understand that it was how my dad reflected God and now looking back on his life it was how God used my dad. The last 30 years of my dad’s career he was expert witness in court cases where car dealers were suing General Motors, Ford or Chrysler for bullying them. He was the Robin Hood of the car business, he helped lawyers take from the giant corporate bullies and give to the beleaguered car dealers. My dad was always up for a battle of wits with the fiercest corporate lawyers and his company MPG (Management Performance Groups) was hated and I mean hated by the big three’s legal teams. Love is a risky business and risk is another place my dad shined God’s glory. God risk giving me free will, WOW! God risk loving Judas, Ahab, Hitler and me. Yes, God is the ultimate risk taker and my dad also reflects that. My dad with no college at all applied for and got a job with Buick motor division when he was 19 years old. He was the youngest assistant car distributor ever and I feel certain that record will never be broken. By 1966 he was the Chicago Zone Business Manager and at the Chicago Auto Show that year all the big wigs were coming down from Flint and wanted to see Tony Bennett who was singing at Cobo Hall, my dad went down to get a table and when he arrived, Chrysler had the front row table with a huge Chrysler ice statue. Talk about a risk, he tipped the maitre ‘d $1,000 and when the Buick Executives arrived they were seated in the front with a Tri-Shield (Buick) ice statue. A week later my dad was promoted to Flint as Director of National Used Car Sales for Buick. Yes my dad was a risk taker. My dad loved adventure, especially the Colorado Mountains where he was born. Even at 86 he still took us trout fishing, he loved those mountain roads, flying around the curves, I feel quite sure my daughter saw her life flash in front of her eyes many times on that mountain drive. Adventure is risky, it brings out the man in you and my dad reflected that masculine heart. He took my brother and I salmon fishing in Vancouver, Canada when he was in his 60’s a trip my brother and I will always cherish. He took my wife and I to Hawaii just two years ago driving the road to Hana he was in his element, adventure. Yes God loves adventure, look at any Character in the Bible and God always took them on an adventure, Noah, Abraham, Jacob, Moses, Peter (got his feet wet), Paul, oh my goodness did Paul have adventure. Another place my dad was greatly misunderstood and perhaps his biggest struggle, my dad was a ladies man. No doubt about it, and its a good thing or I wouldn’t be here to tell you about it. My wife would tell you, he set such a standard that my wife Tammy has compared me to him for years, “why can’t you close the car door after I get in like your dad does for me? Why can’t you just sit and talk with me like your dad does?” Oh, brother, a hard act to follow. Yes, my dad was married three times and in our deepest conversations he would share with me his desperate need to feel loved. He struggled here, but he also succeeded in many ways. When my mother’s mental health was at a critical tipping point he was given a choice by her doctors to leave his beloved career with Buick and it’s lifestyle or lose my mother’s mental health. He chose her, and she did recover and I got my mom back for more that 46 years after that, yes their marriage didn’t end well but that choice bore much good fruit. As John Eldredge would say, he rescued his beauty. In that moment he reflected our Saviors rescue of us, sacrificing his own life in the process. Thus to my last point, “Great men don’t stay dead they come back from the dead”. After my father left Buick he really struggled, having risen to such heights then working at a car dealership he expected the workers there to have upper level GM professionalism and drive. All told he tried 5 times to be a car dealer all 5 he was either fired or went broke. The last time he was fired by Les Shellabarger Chevrolet in Grand Junction Colorado, Les even told him that God said he should fire him. At the same time his second marriage failed and I was with him that night, a crying despondent 50 year old who thought his once glorious career and family was ruined, why, why; he cried as he held his snub nose 38 to his head. With God’s help we made it through that night, the next day he got up and went to apply for a job at a car dealer 20 Group Company in North Carolina called Egan Management, within 3 years he remarried with two more step daughters and founded MPG also a 20 group car dealer company. Proverbs 24:16 For a righteous man may fall seven times And rise again, But the wicked shall fall by calamity. Yes, great men don’t stay dead and my dad is not, I will see him again, but “Not yet, Not Yet”. Right this moment my dad is with Jesus and they both want all this for you; a battle to fight, an adventure to live and a beauty to rescue. Jesus came that you would have LIFE and LIFE abundantly. My dad had that life because at an early age he believed that Jesus was the Son of God sent here by the father to die on a cross and with that self sacrifice, Jesus paid for my dad’s sin, yours and mine. He believed that in order to live forever with God we need to accept that gift by faith and by faith alone, not by works… ITS A GIFT and Jesus died risking everything to rescue His beauty, YOU. Please believe and join us in heaven.